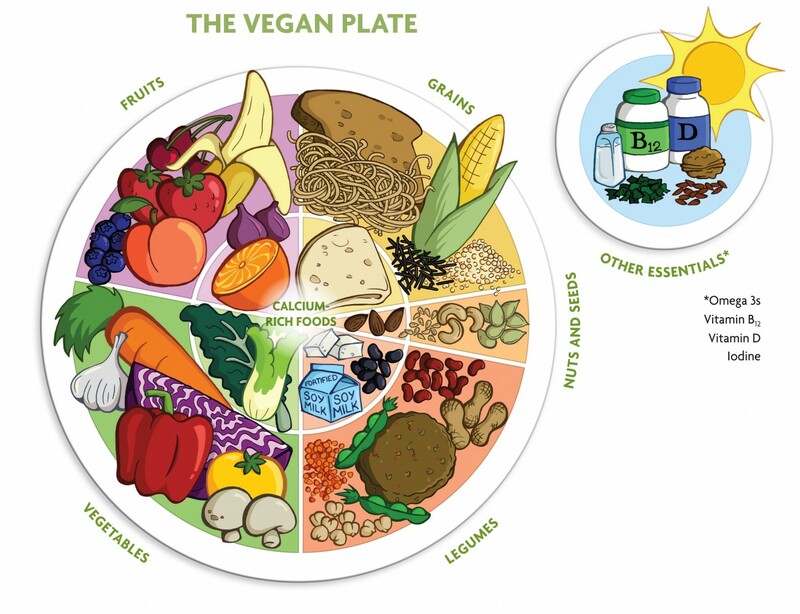 The Vegan Plate | Brenda Davis R.D. Graphic from “Becoming Vegan: Comprehensive Edition” (2014) and from“Becoming Vegan: Express Edition” (2013), both by Registered Dietitians Brenda Davis and Vesanto Melina, Book Publishing Co. 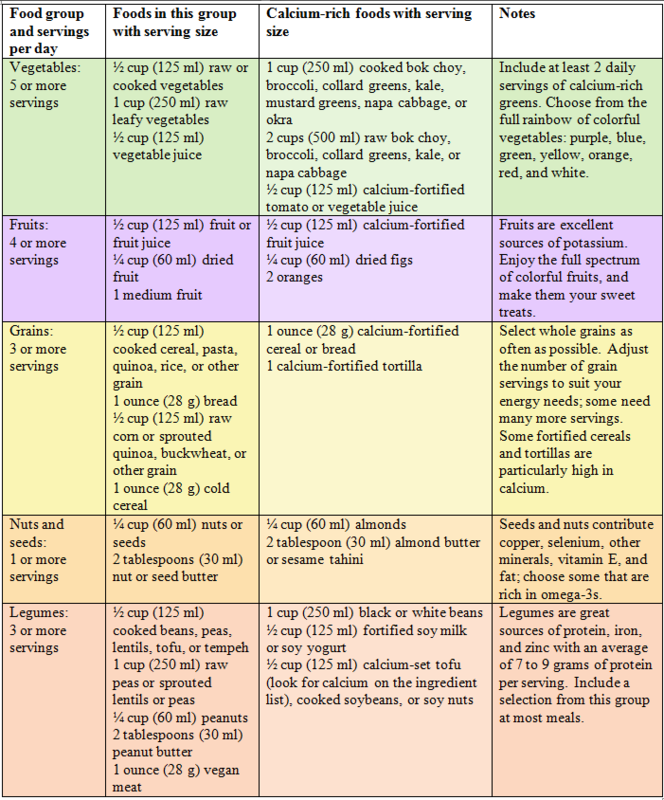 This vegan food guide was designed to ensure that your diet provides all the nutrients you need for good health. While following the guidelines provided will ensure most nutrients, some deserve special attention. These are addressed in the section titled “Other Essentials”. Here are recommendations on a few essential nutrients of interest to vegans: omega-3 fatty acids, vitamins B12 and D iodine. For more. Taking supplement of 200 to 300 mg of supplemental vegan DHA two to three times per week may be beneficial for some individuals (such as during pregnancy or for those with diabetes). A supplement that combines DHA with EPA can also be used. • Three servings daily of foods fortified with vitamin B12, such as nondairy milks, vegan meats, or breakfast cereals, totaling 4 mcg of vitamin B12 for the day (100 percent of the daily value). For one of those servings, you can use 2 teaspoons (10 ml) of Red Star Vegetarian Support Formula nutritional yeast flakes. • Expose your face and forearms to warm sunlight (between 10 a.m. and 2 p.m., without sunscreen) day, for fifteen minutes if you have light-colored skin, twenty minutes if you’re dark-skinned, and thirty minutes if you’re a senior. • If you can’t get enough sun exposure—for instance, during winter, especially in northern latitudes—take a supplement or eat fortified foods. The recommended daily vitamin D intake for adults is 600 IU (15 mcg) to age seventy and 800 IU (20 mcg) after seventy. Amounts of vitamin D as high as 1,000 to 2,000 IU (25 to 50 mcg) are considered safe. • About ? teaspoon (2 ml) of iodized salt. Note that sea salt generally isn’t iodized; if it is, this will be declared on the label. • Eat a wide variety of foods from each food group. Variety helps ensure you consume sufficient quantities of a broad range of nutrients, phytochemicals, and fiber. It also makes meals much more interesting. • Fill at least half of your plate with vegetables and fruits. • Be moderate in your intake of concentrated fats, oils, and added sugars. These foods are generally rich in calories but poor sources of nutrients. Excessive intakes of fat and sugar will crowd out foods that offer valuable nutrients. It’s better to use whole foods such as seeds, nuts, avocados, and olives as your sources of fat, and fruits as your source of sugar, rather than extracted oils and sugars. • Watch your sodium intake. Using ready-to-eat processed foods can make life easier, but relying excessively on canned, frozen, and other processed foods can result in excessively high sodium intakes. • Aim for an hour of physical activity each day. Activity is central to energy balance and overall health. It also helps maintains muscle strength, bone density, balance, and mental well-being. • Drink enough water to stay hydrated. Fluids such as water, herbal teas, and vegetable juices can help maintain good health and prevent kidney stones and urinary tract infections. Let thirst be your guide.